^ Bunzel-Drüke, M. Ecological substitutes for Wild Horse and Aurochs (PDF). Natur- und Kulturlandschaft, Höxter/Jena. 2001, 4. （原始内容 (pdf)存档于2006-03-09）. ^ International Commission on Zoological Nomenclature. 2003. Opinion 2027 (Case 3010). Usage of 17 specific names based on wild species which are pre-dated by or contemporary with those based on domestic animals (Lepidoptera, Osteichthyes, Mammalia): conserved. Bull.Zool.Nomencl., 60:81-84. ^ Vuure, T. van. 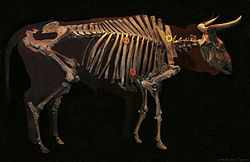 History, morphology and ecology of the Aurochs (Bos primigenius) (pdf). Lutra 45-1. 2002. ^ Vuure, C. van. Retracing the Aurochs: History, Morphology and Ecology of an Extinct Wild Ox. Sofia-Moscow: Pensoft Publishers. 2005. ^ Shaffer, Jim G. Cultural tradition and Palaeoethnicity in South Asian Archaeology. (编) Ed. George Erdosy. Indo-Aryans of Ancient South Asia. 1995. ISBN 978-3-11-014447-5. ^ Shaffer, Jim G. Migration, Philology and South Asian Archaeology. (编) Ed. Bronkhorst and Deshpande. Aryan and Non-Aryan in South Asia. 1999. ISBN 978-1-888789-04-1.